This design may be popular now, but it used to be that only the real trendsetters knew about it. Due to the extremely complex pattern and striking colours, the average Joe Bloggs paid no notice to this insider tip. 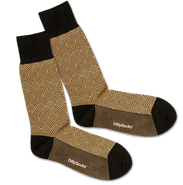 That's why the Early Adopter socks really were only worn by early users, who are always on the lookout for the newest and most innovative advances in socks.